Eric Leutheuser thought he was well-known. As the owner of the Hillsdale’s Buick GMC car deal­ership for three decades, he spent thou­sands of dollars adver­tising his name. 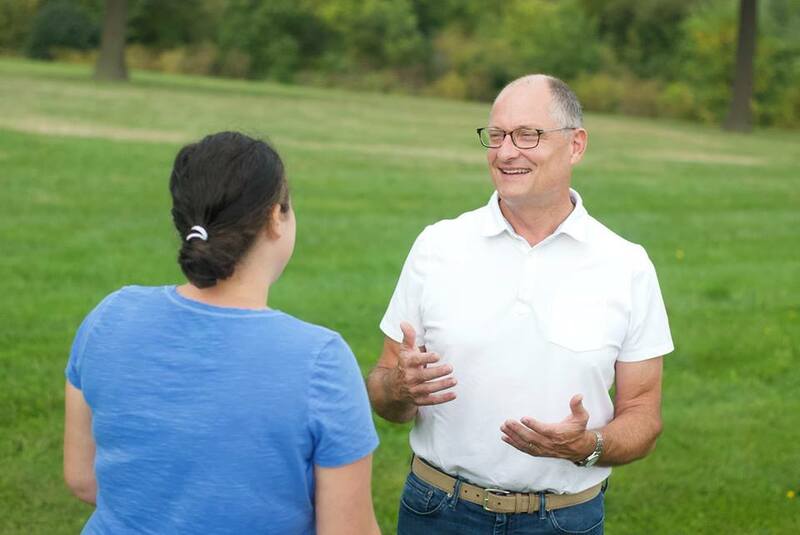 But when he decided to run for state rep­re­sen­tative in Michigan’s 58th dis­trict in the 2014 elec­tions, he quickly found out that the people of Branch County, a mere 15-minute drive away, had not heard of him. Now, four years later, the people of Branch and Hillsdale Counties cer­tainly know him. On Nov. 6, they re-elected him for his third and final term. In the deep red ter­ritory of Michigan, Leutheuser won 71 percent of the vote. Leutheuser grew up in Hillsdale and his father owned the Buick GMC deal­ership. After fin­ishing his edu­cation in Hillsdale’s public schools, Leutheuser decided to go away to college. He spent two years at Central Michigan Uni­versity. But his interest in pol­itics brought him back to Hillsdale College since it was one of the few schools in the 1980s to have an oppor­tunity like the Wash­ington-Hillsdale Internship Program. “I enjoyed WHIP so well that I decided to take a semester off and work on a political cam­paign,’ Leutheuser said. He worked for the cam­paign of David Stockman, a Michigan con­gressman. Stockman was re-elected but went to work as Pres­ident Reagan’s budget director. “So about 72 hours after we got him re-elected he went to the White House,” Leutheuser said. Though Leutheuser enjoyed pol­itics, after grad­u­ating from Hillsdale College in 1982 with a degree in political economy, he went to work for his father at the deal­ership and even­tually took over the business. He was still inter­ested in pol­itics but decided it was best to make a living and raise a family first. “In between then and now there was a 30-year hiatus where I decided to make a living and raise a family because pol­itics is a harsh way to make a living and a harsh way to raise a family,” he said. After his kids were out of the house, Leutheuser decided to get involved in pol­itics again. He ran for state rep­re­sen­tative of Michigan’s dis­trict 58, which is com­posed of Hillsdale and Branch County. His work at the car deal­ership pre­pared him for the task ahead. “I got 30 years’ practice lis­tening,” Leutheuser said. But once he was in office, Leutheuser had a hard time jug­gling his job at the deal­ership and his respon­si­bil­ities in Lansing. Now that he is in his third and final term, he looked back on the course of his time as a rep­re­sen­tative and how the term limits have dic­tated his work. “Every­thing is so accel­erated because of the term limits,” he said. In the first two-year term, his col­leagues were trying to evaluate him. In his second term, Leutheuser had more expe­rience and became a leader in com­mittees and strategic planning. “By the third term you’ve got all that but sud­denly people are looking at who is coming behind you. It’s kind of like your shelf life is so short,” Leutheuser said. During his time in office, Leutheuser has worked on various bills including ones related to domestic-abuse shelters, auto-insurance reforms, and reli­gious freedom for faith-based foster care and adoption agencies. Now that Leutheuser is in his last term, he is looking to the future and what he will do once his last years as rep­re­sen­tative are over.